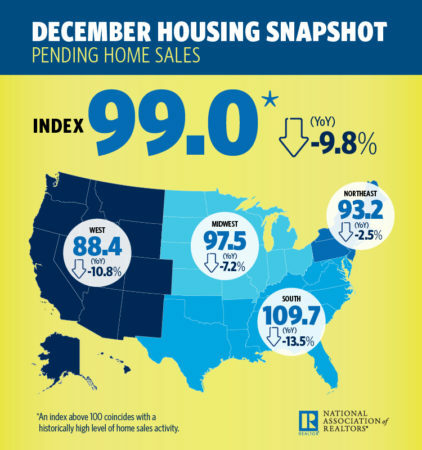 The National Association of Realtors Pending Homes Sales Index declined 9.8 percent year-over-year in December, marking the 12th straight month of annual decreases. The forward-looking indicator, which is based on contract signings, also decreased by 2.2 percent from November to December. “The stock market correction hurt consumer confidence, record high home prices cut into affordability and mortgage rates were higher in October and November for consumers signing contracts in December,” said NAR Chief Economist Lawrence Yun in a statement on Wednesday. All four regions NAR tracks – the Northeast, South, Midwest and West – experienced year-over-year declines, with the South experiencing the biggest dip in contract signings (-13.5 percent). Yun said the 35-day government shutdown had little impact on home sales in December, but if another shutdown takes place after President Trump’s three-week negotiation window for the wall, home sales will drop. Despite the negative impact on sales due to October’s dramatic stock market correction and four, consecutive mortgage rate hikes from September to December, Yun still maintains a positive outlook for the housing market in 2019.